After the evening traffic from the Sept. 25th Vols. 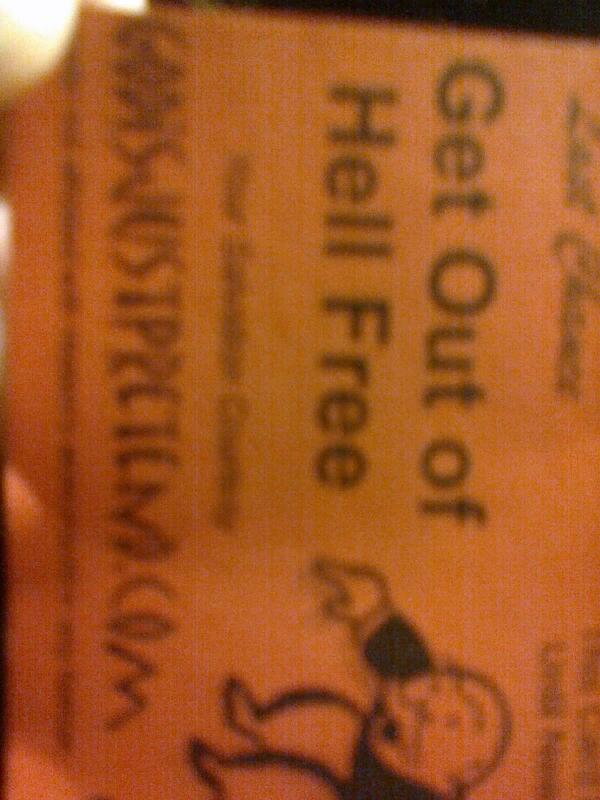 win, I headed down to Cumberland Ave. and started handing out Salvation/Gospel tracts. One incident, I handed a gentleman a Gospel tract and told him, “Jesus loves you.” He became very hateful to me and very loudly said to ears of others nearby, “NO HE DOES NOT!” He wanted to appear macho to his lady friend accompanying him. So by belittling me, he felt superior. I never take any insult personally when it comes to sharing the faith. I read I Corinthians 13. The second time I read it, I substituted the word “love” with “Jesus”. Many people cocked their heads as I read this passage. Many are used to hearing the “Hell” and “Judgment” passages it took them off guard I would be reading this passage. I do read passages mentioning “Hell” and Judgment”. If it is in the Bible, it gets read. Paul stated to his readers, “Have I not shunned to declare to you the WHOLE COUNSEL of GOD?”(Acts 20:27). I could also tell from the evening, I was getting some much-needed help from the Holy Spirit and the prayers of believers. Evangelism is fun, exciting, and hard labor. So, I always ask the Lord for help in any way possible to carry out what he has gifted me. On a positive note, I was able to share my faith with one of the security guys at a local fast food restaurant on the Cumberland Strip. During home games, extra security is hired at the fast food joints to help with any potential drunk or rowdy fans from both teams. I always end in prayer after an evangelism outing. This helps me in knowing God has allowed me to share my faith by the power of the Holy Spirit. I will be thankful for any seed planted in the heart of those reading the tracts. Time is short and I want to see as many people come to repentance and faith in Jesus. So if I have free time in the afternoons and evenings, I want to obey The Great Commission. This short blog is in memory to the little old lady in Joplin, Missouri who was with her church group back in 1995 on Main Street preaching the Gospel to lost high school and college kids. I remember when I was first in college(1995-1996) and a group of us were cruzin Main st. a church group was up and down the sidewalks of the Main cruzin drag for over a mile. At one corner we stopped at a little old lady approached our car and gave us a Chick tract and a Tootsie roll. I will never forget that lady as long as I live, she is one of the reasons I want to continue her legacy and Evangelize to the lost. She told us to be careful out here and Jesus loves and so did she! I know more likely her church was very conservative, KJV Bible only people, yet that old lady I cannot get out of my mind because I knew deep down I met a woman who loved her Lord and loved her Lord’s people. Thank you, Sister in the Lord. I shall see you in Heaven! You will get a big ol’ hug from me! Christian Evangelist meets Atheist Evangelist! I am keeping this tract and not throwing it away. It will remind me to pray for this man to come to faith and repentance in Jesus. I moved elsewhere down Cumberland. This time I was on the corner in front of Taco Bell. Across the street was a bar with its garage doors open. (Tin Roof) Next to the Tin Roof was a liquor store. I read scripture again and lots of college kids walked by me. A young pretty black college girl walked by me and for a few seconds turned around from her friends and her eyes met mine. I smiled and said a silent prayer for her. Soon afterward, another group of kids walked by me. A young man told me to keep up the work. I handed him a tract. He told me he was a Presbyterian. I told him, “Well, I give it to you so you can give it to someone who needs it.” He said, “Ok.” He smiled and walked on with his friends. I kept reading scripture til I had the need to stop to rest my voice. As I left, I prayed for everyone I met or who walked in earshot of me for repentance and salvation to those unsaved. To the saved, an encouragement for them to encourage them in the faith. Now for all of the believers reading this blog: As a unique prod to your soul, I encourage you to follow the Great Commission and share Jesus with others. If the Atheist Evangelist giving me a tract proclaiming his faith in Atheism(or lack thereof) then what a unique prod it should be for us to proclaim Jesus to ALL the Lord puts in our path. Time is running out, the Rapture is around the corner. Let us make sure people have the opportunity to hear the Gospel of Jesus(faith and repentance) so they can make the choice for the better and not miss the Rapture and miss the wrath and judgment of God for the unbeliever. I did go out tonight on Cumberland Strip to pass out tracts and read the bible outloud. Yet, I wanted to repost one of my encounters from the past on and encounter I had with a college man trying to lay the mack on some freshman girls. Evening Evangelism on Cumberland Strip. It hurts to see how homosexuality is becoming more blatantly open among the young people. They seek love in a place where they will never be truly satisfied. I mainly open aired preached/bible read from portions of Romans, John chapter 3, 2 Timothy 4, Isaiah 54, Psalm 1, and various other scriptures. What occurred differently reading the Word tonight from this afternoon, I really felt the Holy presence of the Lord. I became so convicting to me and my heart hurting for the college students, I started to verbally weep during the reading. I had to stop at times, take a deep breath, and ask the Lord for strength to continue and not lose my voice. It was the book of Romans that I started to verbally weep. Not so much in other scripture, except my voice raised a degree when reading John 3:16. I remember how John Wesley fell under the conviction of the Lord when he heard the introduction to the book of Romans. I do not know how much longer we have til the Rapture. Yet, the Lord is lovingly patient. There will be a point in time where the Lord will initiate the Rapture. I just want to be used by the Lord to share Jesus with as many people as possible. There are so many who will die in their sins be killed by numerous outcomes from the Rapture and the 7 year tribulation. Prior to the Rapture….when ever it will occur….as believers we must keep allowing ourselves to be used by the Lord in bearing fruit. Let’s pack Heaven now while we have breath and life by sharing the Gospel. (The Bema Seat of the believers will be what we are rewarded for the pure motives of serving the Lord.) Not that getting rewarded is a great incentive, but most important is seeing God glorified in all we do. So Evangelism is necessary and the Great Commission is still in effect. Which leaves me with being obedient to the Lord’s call on my life. I cannot do what I do without the power of the Holy Spirit(Zechariah 4:6). In the evangelism outreach, I want to always be loving and yet still convey the Truth in love.